When setting up (i.e. moderating) a multi-player game you can adjust several game options. Once selected, these options will be in place for the duration of the game. You cannot change them partway through a game. Instead you would need to quit the current game a start a new one with different options selected. 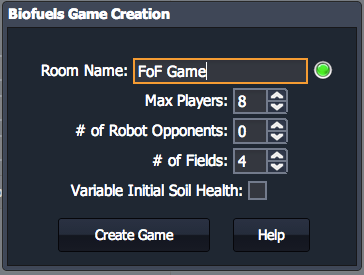 Room Name: Enter a short name what will identify your game. It is OK to include spaces in the name. You will share this name with players, so be sure to remember it or write it down! Max players: Enter the maximum number of players that you expect to join. It's best to make this number higher than the actual number of players in case you have more than expected. Once the max number of players is reached, no new players will be able to join unless you quit and start a new game. # of Robot Opponents: You can add computer-generated "robot" opponents to the game. The bot players will make decisions to get the highest score based upon a computer algorithm. Adding bot players can be useful if you want to see how game outcomes change with more players. In addition, the moderator can assign different strategies to bot players, such as maximizing environment or economic scores, which can be useful for comparing different strategies and tradeoffs. Read more about computer players in the bot players section. # of Fields: Choose how many fields each farm will have. Each field is modeled as being 40 acres. You can choose between 2-6 fields per farm. Variable Initial Soil Health: The game default setting is for all fields on all players' farms to start with the exact same fertility (i.e. 1400 kg of N/acre). If you check this box each, field on a player's farm will start with different initial soil fertility. Some fields will have higher fertility, others lower. But the average fertility for a farm will be the same for all players so as to make the playing field even. Checking this box will add a layer of complexity to the game. Players will need to adjust their planting and management decisions for each field so as to achieve the most sustainable outcome. Read more about soil fertility in the environment field-level section.